Today on The Edgy Veg, I’m going to show you how to make an easy vegan hot pot recipe! This vegan hot pot recipe is made with a hearty blend of tofu, mushrooms, and a variety of veggies, which is perfect as a fall and winter dish to warm you from the inside out. A typical Japanese hot pot would feature slices of meat and fresh vegetables cooked together in a large open hot pot. But since we don’t eat that type of thang; I’m going to show you how to prepare this hot pot recipe without any meat or other yucky animal products! If you’re looking for more vegan dishes like soups & stews, check out my list of vegan soup recipes here. 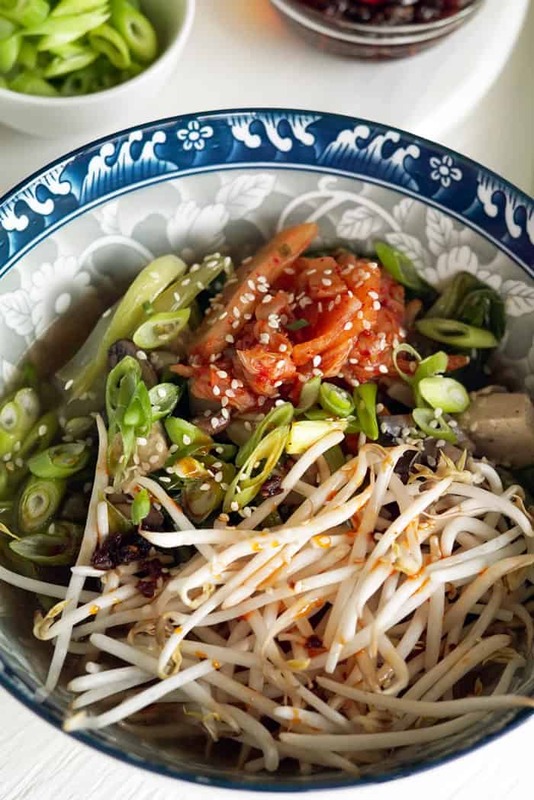 In terms of vegetables, this vegan hot pot tofu recipe is comprised of mushrooms, onions, carrots, baby bok choy, bean sprouts, and fish-free kimchi. Super simple, yet healthy and tasty. Once you make this recipe, you’re gonna want to slurp it right up! If you want to view or print the recipe card, just scroll down for the full list of ingredients and simple instructions on how to make this easy vegan hot pot. To make this easy vegan hot pot, you first want to start by heating oil in a large pot over medium heat. Then, add your ginger and garlic; stirring until fragrant for about 1 minute. Next, add your mushrooms and cook until slightly soft, 3-5 minutes. Stir in broth, soy sauce and the white parts of the green onion, and carrots. Cover and bring to a boil. Add your tofu, cover and simmer until carrots are soft, about 5-10 minutes. Add the bok choy, and cook with a cover, until tender, 2 to 3 minutes. Remove from heat. And season the broth with salt to taste. At any point, you can cook your Asian noodles of choice and divide the cooked noodles between 4 soup bowls. Ladle the soup into bowls, dividing the veggies evenly. Top with bean sprouts and the green parts of the green onion. Serve with sesame and chili oil at the table and voila! This vegan hot pot recipe is a vegan version of a traditional Japanese dish. This tofu-based recipe is full of yummy vegetables and easy to make! A meal to share with the entire family! Add ginger and garlic; cook, stirring, until fragrant, about 1 minute. Add mushrooms and cook until slightly soft, 3-5 minutes. Stir in broth, soy sauce and the white parts of the green onion, carrots; cover and bring to a boil. Add tofu, cover and simmer until carrots are soft, about 5-10 minutes. Add the bok choy, and cook, covered, until tender, 2 to 3 minutes. Season the broth with salt to taste. Divide the cooked noodles between 4 soup bowls. Ladle the soup into bowls, dividing the veggies between evenly. Top with bean sprouts and the green parts of the green onion. Serve with sesame and chili oil at the table. You guys must try this Vegan Hot Pot recipe, you will love it! Once you try it, come back and leave me a comment below with your feedback and star rating! If you make this, let me see! Tag @edgyveg on your photo and add the hashtag #theedgyveg in your caption so I don’t miss it! Click here for New Vegan Recipes from The Edgy Veg.